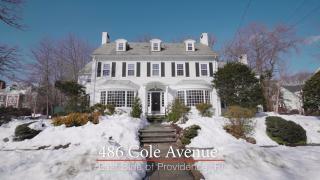 This classic Center Hall Colonial is located in the desirable Blackstone neighborhood. Warm hardwood floors span across the exquisite floor plan filled with incredible details and natural light. The center hall is flanked by an elegant dining room with crown molding, and a gracious living room with a fireplace. Each are superb settings for every occasion that boast panoramic bay windows. A chef’s kitchen, with professional grade appliances and an extensive center island, opens to the family room where you can relax with friends and family around the large fireplace. From multiple places on the first floor you can step out to the lovely terrace and garden with mature plantings. Dine al fresco and host garden parties in this private city oasis. The second level includes 3 generous bedroom suites including a master with a dressing room and a private bath with a glass enclosed shower. Above the family room is a two room suite with a sitting room, fireplace, and a private bath. This extensive suite is perfect for an au pair, home office, or visiting friends and family. A finished third floor has two additional bedrooms that share a vintage bath, while the lower level has a game space with a bar.